Learn About Salmon in Portland Did you know Portland is working to recover and protect local endangered salmon? We are Portland's sewer and stormwater services provider. We work to protect and improve watershed health. We plan, design and construct system improvements. We work with industries to pretreat wastewater and manage stormwater onsite. Learn more about the stormwater discount program. We are committed to providing meaningful access. 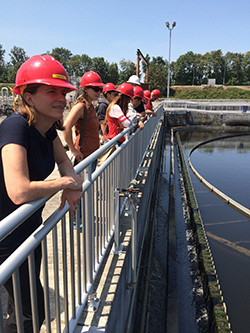 Environmental Services manages Portland's wastewater and stormwater infrastructure to protect public health and the environment. The Columbia Boulevard Wastewater Treatment Plant is Oregon's largest water reclamation facility. Come and see firsthand how the plant works. Book individual or group tours at http://www.portlandoregon.gov/bes/tours. For more information, call 503-823-2400.